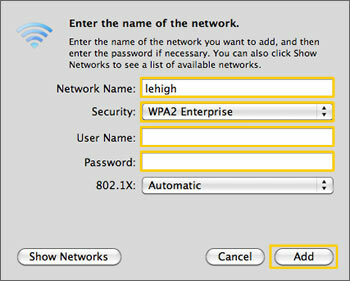 Below are instructions for configuring wireless settings for the Lehigh network on Macs running Mac OS X Lion (10.7.x) and newer. In order to successfully complete configuration you need to be in a location that provides a Lehigh wireless signal. Steps 1-4 cover establishing a connection to Lehigh wireless. Steps 5-13 cover what settings to check when encountering a problem connecting to the wireless network. If you run into problems and the troubleshooting steps do not resolve your issue you can contact the LTS Help Desk in person in the EWFM library or by phone at 610.758.HELP(4357). Click the AirPort status icon on the menu bar at the top-right corner of your screen and select lehigh. When prompted, enter your Lehigh userID(abc123) and password into their respective fields and click Join. 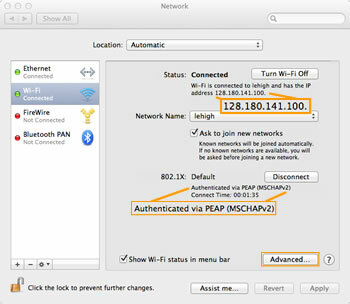 ** You will notice that Mac OS has already identified the network as a WPA2 Enterprise network. When the Verify Certificate window appears, click Show Certificate to reveal certificate details. Make sure that Always trust... is checked. Click Continue. 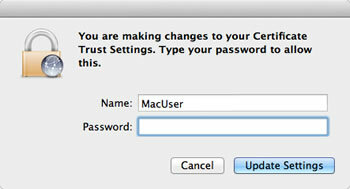 When prompted, enter your Mac username and password, then click Update Settings. If you encounter a problem connecting to the wireless network, follow the troubleshooting steps below: Click the AirPort icon on the top menu bar and you should see a checkmark next to lehigh indicating that you are connected to the network. 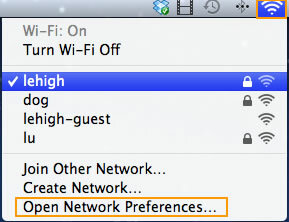 If you are unable to view web pages, open the AirPort menu again and select Open Network Preferences. Verify two things to confirm if you are successfully connected: 1) Your IP address should start with 128.180 2) You should be authenticated via PEAP (MSCHAPv2). 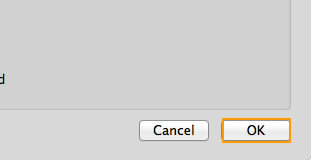 If either or both of these are not correct, click Advanced to open the advanced AirPort settings window. NOTE: In order to make changes on any of the Network preference screens, the yellow padlock in the lower-left corner should appear unlocked. If it is locked, click the lock and enter your Mac user name and Mac password into their respective fields. Your account must have administrator privileges to make these changes. 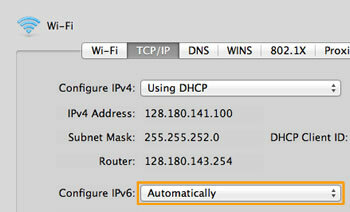 Make sure Configure IPv4 is set to Using DHCP. Also make sure that Configure IPv6 is set to Off. Click OK, then click Apply. If this does not fix the problem, click the Advanced button again and follow the instructions below. If this does not fix the problem, click the Advanced button again and follow the instructions below. 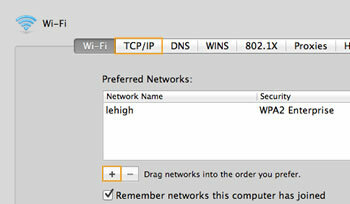 Remove any previous instances of "lehigh" from the list of Preferred Networks by clicking the minus[-] button. Click the plus[+] button to add a wireless network profile. 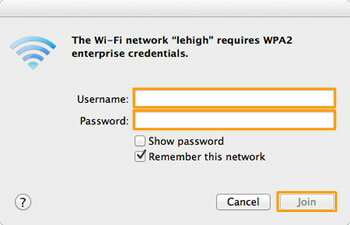 Type lehigh for Network Name. Select WPA2 Enterprise from the Security drop down menu. Enter your Lehigh userID(abc123) and password into their respective fields. Click OK. Click OK. 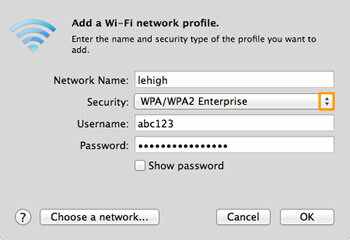 Type lehigh for Network Name. 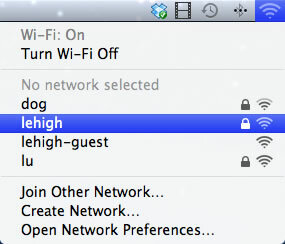 Type lehigh for Network Name. Select WPA2 Enterprise from the Security drop down menu. 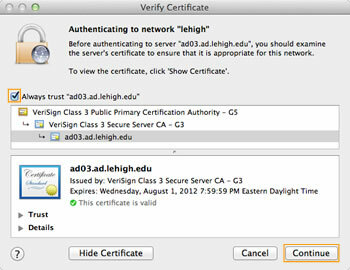 Enter your Lehigh userID(abc123) and password into their respective fields. Click Add. Click Add. Click OK to close the advanced AirPort settings window. Click Apply to apply all the changes. Click System Preferences on the menu bar at the top-left of the screen and select Quit System Preferences from the drop down menu.